If you're an avid follower of this blog, you may already know how many times we've mentioned the inspiration for this blog is Adam Richman's show, Man Vs. Food. We, especially fell in love with the mouth-watering sinful burgers and other mind-blowing comfort food he features there. (Which is our bucket list is to visit those places he's featured). Anyway, the show Man Vs. Food is basically about these outrageous food and then towards the end they will hold an eating contest to see if Man or Food will win. This is how it felt like when I attended Burger King Philippines' Battle of the Stacks King Eating Challenge! Except that the winner will not win a measly t-shirt and his name up the wall. What Burger King has prepared for a prize is a whopping P50,000 and the title of "BK STACKS KING"! Not too shabby at all!!! The BK Stacks are Burger King's finest new members in their menu. Flame-grilled patties with melted American cheese in between each patty, topped with crispy bacon, blanketed with BK Stacks sauce and sandwiched together in soft, toasted sesame-seed bun! The burger didn't look imposing at first sight, but a closer look revealed that the all beef patties would be a formidable foe to any opponent! So the question is, which one of these will you be?? The event was hosted by Sam YG and Ms. Issa Litton, both of whom made the event livelier than it already was! 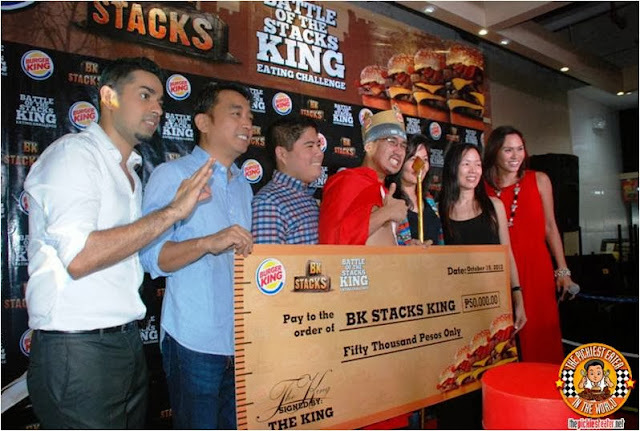 Look at them goofing around and having fun at the stage and Sam YG devouring some BK stacks! (He’s the Burger King Celebrity Ambassador by the way). And if you look closely in one of the photos above, he even got a strip of bacon stuck in his mustache! Hilarious! This time, let's meet the challengers! The mechanics was to upload a funny BK Stacks video and post it on Burger King's Facebook Page. The response was overwhelming but there could only be 10 contenders. All of whom finally came face to face last October 19, at the Burger King 2 E-Com Center at SM Mall of Asia Complex, Pasay City. 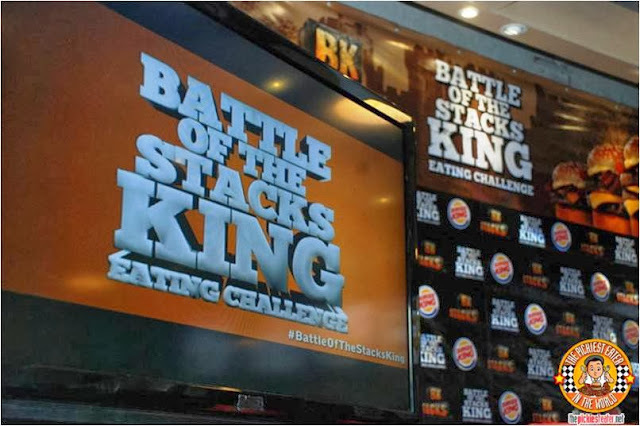 The contestants were all ready for a boxing match of devouring as much BK Stacks as they can within 15 minutes. 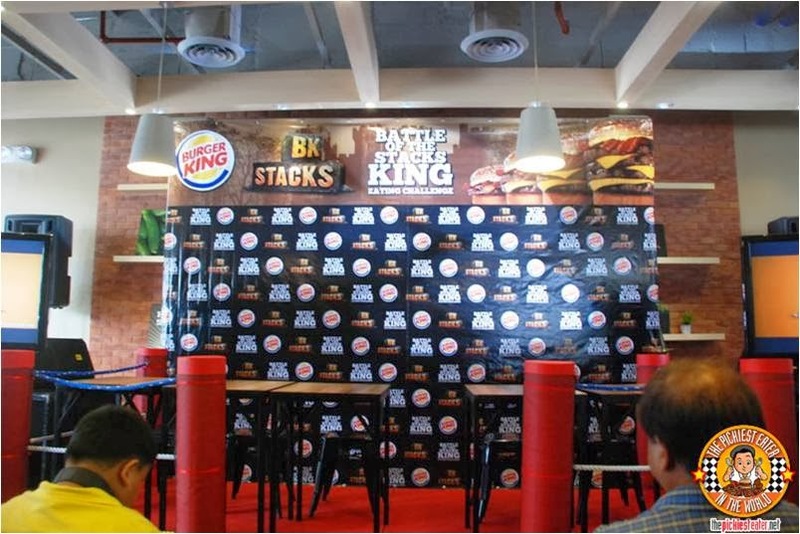 And as if the event needed to be livelier, Burger King had Sam YG and Issa Litton host the event. It was definitely an afternoon of munching, shouting, cheering, and lots and lots of burger patties! Sweats has been shed, cups of large drinks has been gulped down, BK Stacks disappearing left and right. At the end of it all, there was one man standing. 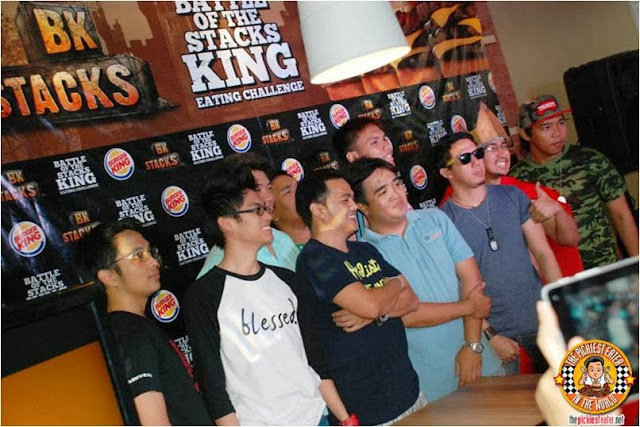 And that was Edward "The Burger Slayer" Garcia of Bajac Bajac, Olongapo City! His trip to Manila (and being the only one in costume) proved to be all worth it! Congratulations King Edward! Burger King is the second largest fast food hamburger chain in the world operating in over 13,000 locations world wide, serving 11 million guests daily in 89 countries! If you are looking for a quick flame-grilled beef patty, head on to the nearest Burger King joint near you!